Amazon Echo vs Tap vs Echo Dot: Which One Is For You? Home Smart Gadgets Amazon Echo vs Tap vs Echo Dot: Which One Is For You? When Amazon Echo launched last year, it managed to take us by surprise. However, it was flocked up by people, thanks to its cutting edge features. The company recently decided to build on Echo’s momentum and launched two new Echo variants, the Amazon Tap and Amazon Echo Dot. While Echo, Tap and Echo Dot are almost identical when it comes to software, they have major differences when it comes to hardware. 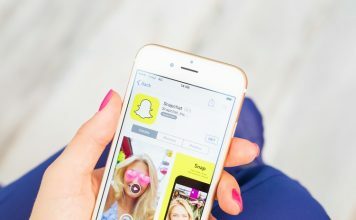 The good thing is, rather than being simple low-cost variants of Echo, these new devices cater to different users and hold their own against the Echo. So, if you have been planning to buy one of them, it’s important to know the differences. When it comes to size, Amazon has designed its speaker/smart home line-up to go from tall to short. 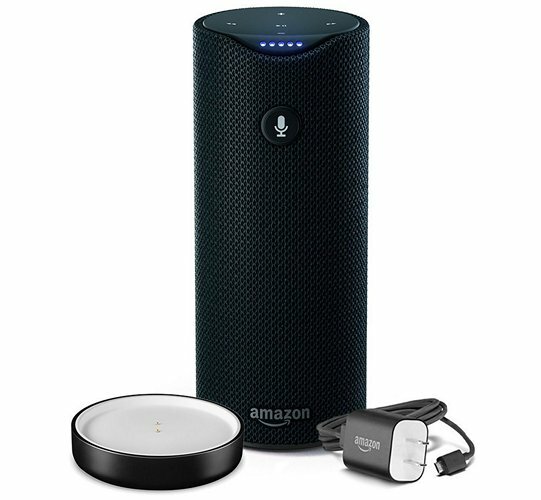 While they are all pretty much cylindrical in shape, the Echo is tall, Tap is medium sized and the Echo Dot is short. You can take a look at their dimensions and weight in the table at the end of the article. All three devices feature volume control in the top ring, along with other controls. 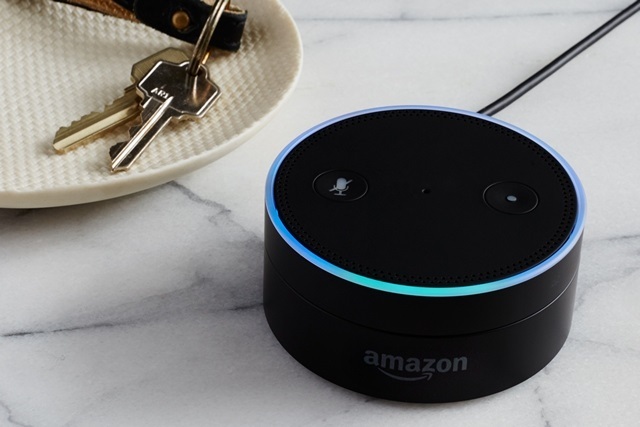 When it comes to hardware buttons and LED lights, the Echo and Echo Dot are similar, as they feature a LED light ring along with buttons for action and mute. On the other hand, Tap features physical buttons for microphone activation, power, WiFi/Bluetooth and dedicated music controls. It also packs in front light indicators. Overall, all three Amazon devices are well designed products. On the connectivity front, the Echo, Tap and Echo Dot come with support for WiFi, as well as Bluetooth. However, Echo and Echo Dot feature Dual-band (2.4 GHz and 5 GHz) tech and support the 802.11a/b/g/n standard. The Amazon Tap packs in a single-band (2.4 GHz) modem with support for 802.11b/g/n. 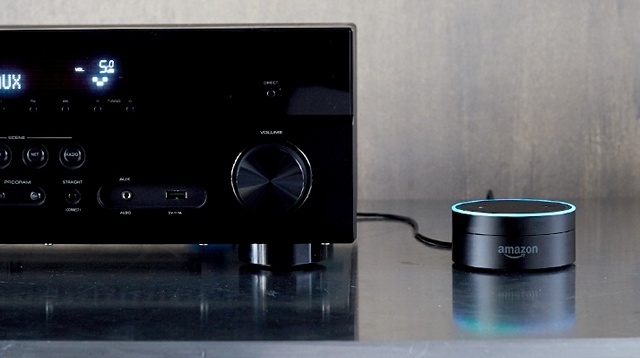 When it comes to Bluetooth & AUX connectivity for audio playback, you can play music from your smartphone on the Echo over Bluetooth and on Tap over Bluetooth & AUX. However, the Echo Dot isn’t necessarily a speaker and it only lets you play music on your external speakers over Bluetooth or AUX (3.5 mm jack). The Amazon Echo and Tap might be smart home devices but they are smart speakers first. 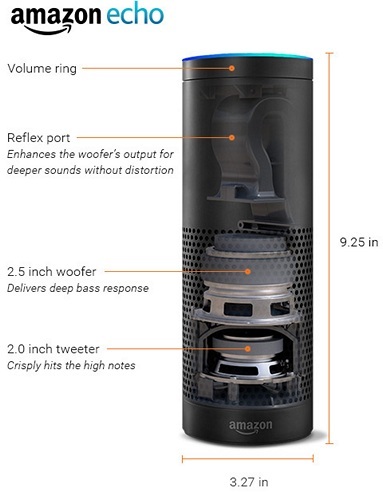 The Amazon Echo features a fairly powerful 360-degree sound system with a 2.5-inch woofer and 2.0-inch tweeter. 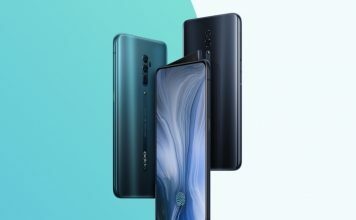 On the other hand, Tap features a smaller 360-degree sound system with dual 1.5-inch drivers, dual passive radiators for bass extension and Dolby audio support. As you might have noticed, the Echo Dot is the only one to pack in ability to connect to an external speaker for music playback. Well, that’s because, unlike Echo and Tap, it does not pack a full size speaker. The Echo Dot only features a tiny speaker, which should be good enough for Alexa’s voice feedback. 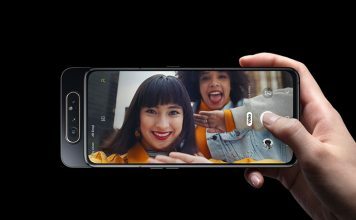 So, to play music from the Dot, you will need to have an external speaker connected. The Amazon Echo and Echo Dot are devices that should be set up at home, while the Tap is more of a portable device. 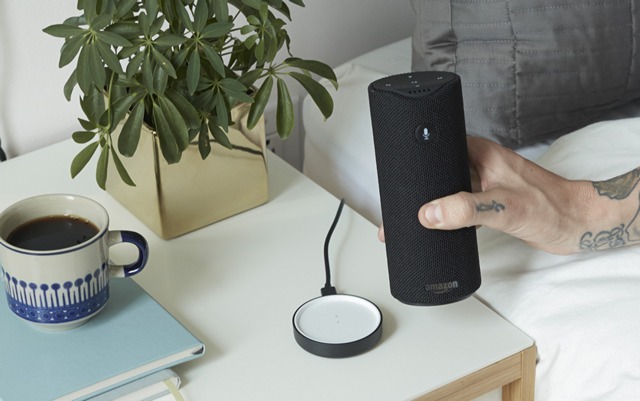 That’s because the Echo and Echo Dot need to be connected to a power outlet all the time, while Tap can run on battery, with Amazon claiming 9 hours of continuous audio playback with the device. Amazon has also included a cool charging cradle with the Tap. We love how Amazon has not differentiated between the devices when it comes to Alexa features. All the three devices run the same Alexa OS and can do things like play music from Amazon, Spotify or your smartphone, control smart home devices, bring weather details & news, answer questions and more. Moreover, you can even use Alexa Voice Shopping to shop for products on Amazon. It also integrates third party services to let you book an Uber, order a Dominoes pizza etc. There’s one difference though. The Amazon Echo and Echo Dot are always-listening devices and you can just say “Alexa” to wake them up. On the other hand, you cannot voice activate Tap and you will have to press the microphone button on the device to start talking to it. 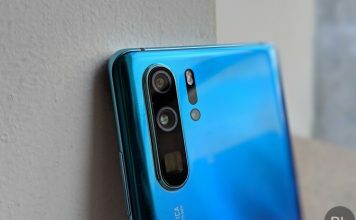 As of now, the three Amazon devices are only available in the US. While you can buy the Amazon Echo ($179.99) and Tap ($129.99) from Amazon.com, you can only buy the Echo Dot ($89.99) through Alexa Voice Shopping. 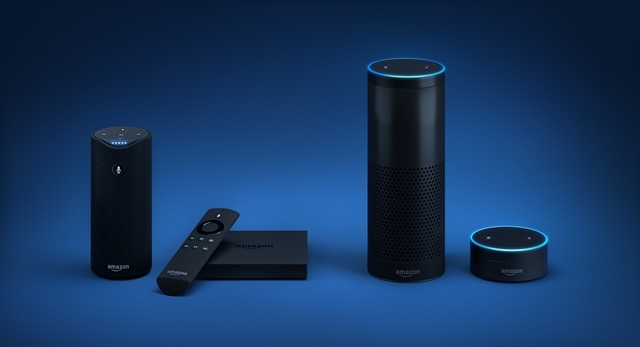 This means, you need to have an Amazon Echo or Amazon Fire TV to order a Dot. Amazom Echo vs Tap vs Echo Dot: Which one should you buy? 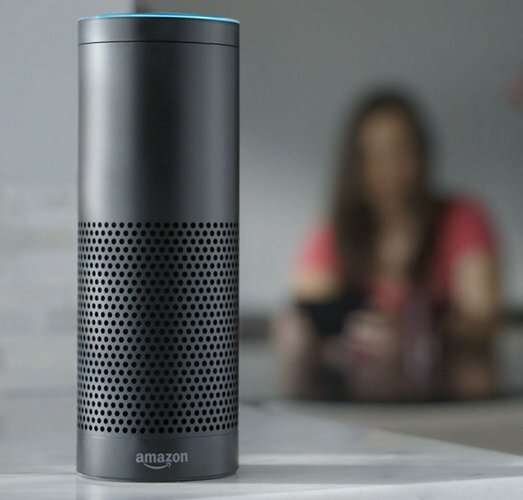 To sum things up, the Amazon Echo is for people who want a smart speaker to accompany your house and since it includes support for far field voice recognition, you can talk to it from anywhere in the house. On the other hand, the Amazon Tap is for people looking for a portable Amazon Echo alternative. 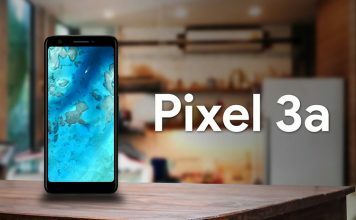 While it lacks the cool “Alexa” voice activation, it makes it up with Dolby audio support and great battery life. Last but definitely not the least, the Amazon Echo Dot is for people who want to use the Alexa features but also want to use their own high quality speakers. Also, it’s very affordable! Well, that’s all from our side but we’d love to know which of these Amazon devices do you prefer. Do let us know in the comments section below.